YAVORIV, Ukraine -- The sounds of gunfire and explosions are constant on the firing range at the International Peacekeeping and Security Center outside this western Ukrainian town. Servicemen of the U.S. Army’s 173rd Airborne Brigade Combat Team (standing) train Ukrainian National Guard members during a joint military exercise called “Fearless Guardian 2015,” at the International Peacekeeping and Security Center near the western village of Starychy, Ukraine, on May 7, 2015. At one spot, behind an earthen bunker, U.S. Army paratroopers are qualifying Ukrainian National Guard soldiers in Soviet-era, shoulder-fired rocket-propelled grenades (RPGs). Further down the line, Ukrainian soldiers shoot at targets using different types of Kalashnikov assault rifles and RPK and PKM machine guns. Together, the sounds of these Soviet weapons form a booming background din, which some of the U.S. soldiers here are all too familiar with. “Yeah, no kidding,” the other soldier responded. 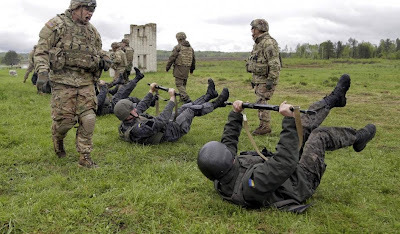 On April 20, about 300 U.S. Army paratroopers from the 173rd Airborne Brigade based in Vicenza, Italy, began training the Ukrainian National Guard as part of a six-month exercise called Fearless Guardian. Like their position relative to the sounds of the Soviet weapons (which the Taliban and Al-Qaida often use) on the Yavoriv range, Fearless Guardian marks a reversal for many of the U.S. soldiers here. For one thing, unlike U.S. missions to train Afghan and Iraqi soldiers, the U.S. Army paratroopers will not be fighting alongside Ukrainians. This leaves the U.S. soldiers in the unfamiliar position of training for a fight in which they don’t expect to have a direct role. “It’s hard not to get emotionally involved,” Captain Nick Salimbene, 31, said. Fearless Guardian also reflects an evolution in the U.S. military’s role in Europe as it reverts to a Cold War-era mindset. U.S. soldiers, some of whom have spent their entire careers in counterinsurgency campaigns in the post-9/11 era, are refocusing on state-on-state warfare, such as training to defend against tanks and heavy artillery. Even the movement of U.S. equipment to Ukraine had a strategic purpose. A convoy from the 173rd’s home base in Vicenza to Yavoriv was used to scout lines of transportation across the region that might be needed for the rapid deployment of NATO assets in a crisis. “It makes you wonder if the Cold War ever really ended,” Sergeant Alexander Skripnichuk said. The U.S. military is also adjusting to the media spotlight that comes with exercises like Fearless Guardian, which, while an independent exercise, is part of a larger rebalance of U.S. military power in Eastern Europe. Highlighting the diplomatic sensitivity of having U.S. troops on Ukrainian soil is an April 17 statement by Russian Foreign Ministry spokesman Alexander Lukashevich, in response to the 173rd’s arrival in Yavoriv. “We wonder if Washington, London and Ottawa know that they will train the very same Ukrainian ultra-nationalists from the volunteer battalions who have Nazi symbols on their uniforms and who killed women, children and the elderly during the punitive operations in Donbass,” Lukashevich said. Citing the Leahy Law, which prohibits the U.S. from supporting foreign military groups accused of human rights violations, a U.S. military official said the Ukrainian National Guard units involved in Fearless Guardian had been thoroughly vetted. Some prominent units have been left out of the training, however, such as the Ukrainian National Guard Azov Regiment, which Moscow has accused of being a neo-Nazi group. Finding Common Ground More than a decade of combat experience in Iraq and Afghanistan has helped U.S. soldiers earn the respect of their Ukrainian counterparts. But the Ukrainian soldiers’ attitude toward their American trainers is not one of unquestioning gratitude. The Ukrainians, some of whom have been fighting in eastern Ukraine for more than a year, frequently challenge the Americans’ techniques, reflecting the challenges of fusing the experiences of militaries that have been tested in two very different types of combat, with different resources available. “These guys just came back. They’re fresh,” Salimbene said. At the RPG range, for example, a Ukrainian insisted on firing left-handed. But after a few minutes of debate, in which the Ukrainian argued that he had shot RPGs left-handed in combat against separatist tanks, the U.S. soldier finally conceded. The Ukrainian hit his target on the first shot. “This is a two-way street,” Salimbene said. The occasional butting of heads also highlights differences in military cultures. At an obstacle-breaching course, a Ukrainian officer peppered the U.S. instructor, Sergeant Caleb Michaud, with a series of questions, challenging his techniques on cutting through barbed wire and quizzing him on what to do if the enemy has machine guns zeroed in on his troops. “Well, then don’t breach there, obviously,” Michaud said. “But what if we planned to breach at that spot?” the Ukrainian officer countered. “Then change your plan,” Michaud replied. The U.S. military chain of command decentralizes decision making from the upper ranks, teaching junior officers and noncommissioned officers to take the initiative to make tactical decisions based on battlefield realities. “If there’s anything we’ve learned from the last 14 years of war, it’s to trust the guy on the ground,” Salimbene said. The Ukrainian military, however, still reflects the Soviet model, in which decision making is concentrated at the top of the chain of command, leaving junior officers with little flexibility to exercise their own initiative. Additionally, the role of noncommissioned officers, considered to be the backbone of the U.S. Army, is virtually nonexistent within the Ukrainians’ ranks. Despite some initial friction, the U.S. example seems to be rubbing off on the Ukrainians, who have started to adopt the U.S. chain of command model. “I think initially they were a little bit standoffish within the ranks themselves, just because ‘Why is someone else coming to train me? I’ve been to the ATO, I’ve seen what’s going on there,’” said Lieutenant Colonel Kyle Reed, commander of the 1st Squadron, 91st Cavalry Regiment. “We’re two very different militaries,” Corporal Nicholas Stevens, 22, said. The U.S. training syllabus was drafted by Ukrainian officials and approved by U.S. commanders. However, as the training progresses and Ukrainian soldiers share their insights from a year of combat against combined Russian-separatist forces, the U.S. soldiers have adapted the training to match the threats Ukrainian soldiers face in the East. U.S. soldiers are prohibited, however, from visiting the conflict areas to see firsthand the conditions they are training the Ukrainians for. “That’s a red line we’re not crossing,” said Major Michael Weisman, the 173rd’s public affairs officer, denying Ukrainian media reports that U.S. Army soldiers had traveled to the ATO as observers. “As close as we can without going there, we have a sense of what tactics are being used,” he added. Fearless Guardian is broken into three two-month blocks. Within each block, a new crop of about 300 Ukrainian soldiers move through a training pipeline that begins with basic individual skills such as shooting and movement drills, progresses through small-unit tactics and eventually culminates in combined company-level exercises. Ostensibly, the U.S. training is not focused on preparing Ukrainians to fight a war against Russia. There is, however, some specialized training tailored to the specific threats Ukrainian soldiers face in the ATO from combined Russian-separatist forces. For example, the U.S. is training Ukrainians in countering IEDs (improvised explosive devices), which U.S. forces frequently faced in Iraq and Afghanistan and are now prolific in the Ukraine conflict. Ukrainian troops are also taught how to conceal themselves from drones (which are observed over their front-line positions daily), as well as how to better encrypt their communications. “We’re trying to tailor it to them, but not so much because of the whole politics issue,” Sergeant Gregory Crocker, 29, said. The training syllabus also includes two days of law of armed conflict training, including instruction in the Geneva Conventions and the ethical treatment of prisoners. “We’re teaching them everything an infantry company should be expected to do,” Weisman said. Mindful of the propaganda attention focused on their presence in Ukraine, U.S. soldiers are careful about how they describe the intent of Fearless Guardian. Others claim the exercise is not geared toward any specific threat or country but is intended to develop the Ukrainian National Guard as a professional fighting force. “As we look to the provocation of us merely being here, I don’t think it was really directed just at the combined Russian-separatist forces,” Reed said. For both the U.S. and Ukrainian soldiers, however, the reality of the ongoing conflict in eastern Ukraine looms over the training. U.S. and NATO officials have accused Russia of building up forces in Ukraine to support an upcoming separatist offensive. “Russian forces used the opportunities presented by the recent lull in fighting to reset and reposition while protecting their gains,” U.S. Air Force General Philip Breedlove, commander of NATO forces in Europe, told the Senate Armed Services Committee on April 30. Russia denies aiding the separatists or having troops in Ukraine. Faced with the near certainty that many of the Ukrainian soldiers under their tutelage will soon be back on the front lines, the U.S. Army trainers in Yavoriv take their training mission personally. Speaking to a group of Ukrainian soldiers prior to a training exercise, Michaud said.